Cleanse and refresh with Panier des Sens The Essentials Rejuvenating Rose Liquid Marseille Soap, a gentle formula that soothes damaged skin. 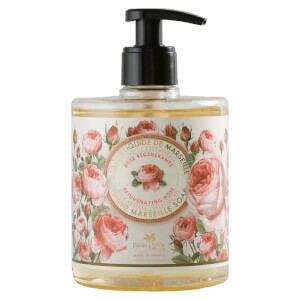 Powered by ultra-nourishing Rose Essential Oil, the hand wash melts away dirt and impurities whilst replenishing hydration to maintain the natural moisture balance. Helping to calm dry and irritated skin, the formula leaves hands comfortable, revitalised and visibly healthy. Aqua (Water), Potassium Cocoate, Glycerin, Polyglyceryl-3 Caprylate, Parfum (Fragrance), Hydroxyethylcellulose, Tetrasodium Glutamate Diacetate, Cocos Nucifera (Coconut) Oil, Potassium Benzoate, Potassium Sorbate, Tocopherol, Essential Oils.